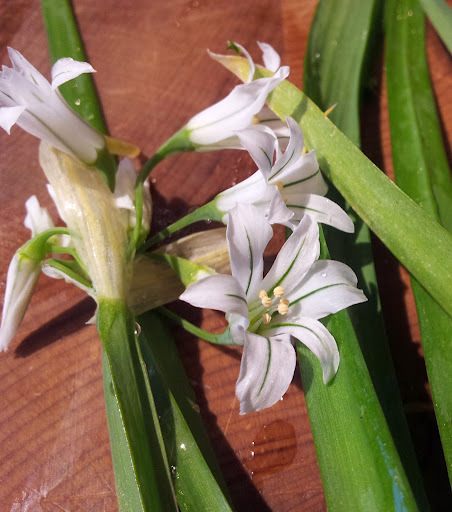 Onion weed I use to curse as a gardener – then I discovered I could eat it and I have changed my attitude. I now think of recipes that I can use when I weed this invasive plant. All of the plant can be eaten. 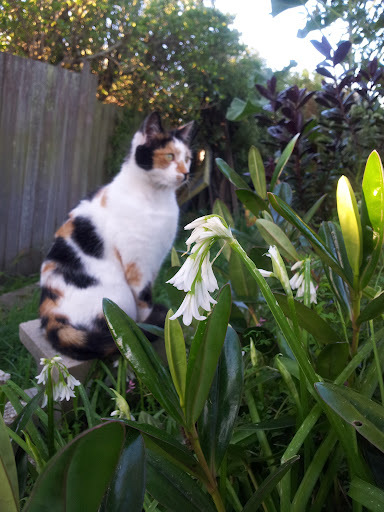 The flowers – a pretty white with a green line – are similar to the spring bulb snowdrops. It does escape into the cultivated garden and it can easily be pulled like a spring onion in this situation. But its favourite habitat is under trees and you will need a spade to harvest them there. 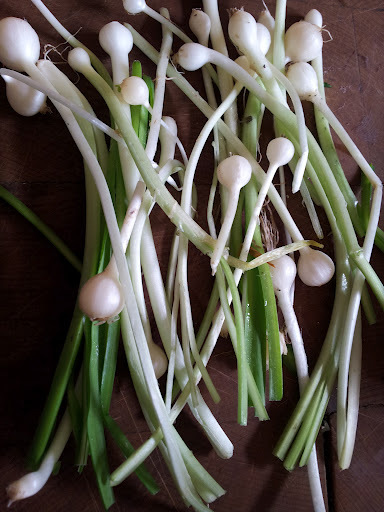 You will need to hose or soak the onions in water to get rid of all the excess soil, and there is usually a thick and slightly slimy skin over the older bulbets, but these come away quite easily to reveal something similar to spring onions. In summer the tops die down but underneath the bulbs, usually the size of marbles, can be dug up and pickled like cocktail onions or sauted whole. Like onions they have a papery tough first skin but if soaked in water this can easily be removed. I haven’t pickled them yet but perhaps I will give it try later in the year. 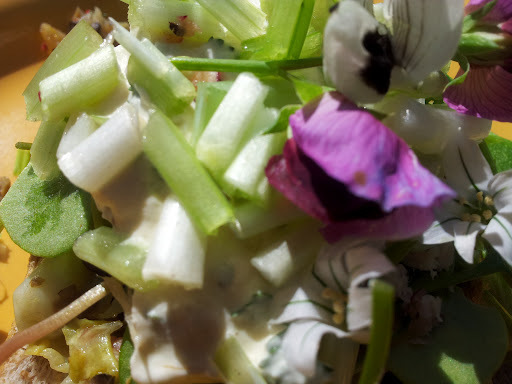 How I use onion weed in a foragers salad…. When I am working in the garden I keep aside any tasty thinnings and edible weeds to be used for a lunch salad. Yesterday I had collected a wild parsnip, horseradish root, miners lettuce, rocket, Southland pea and broad bean shoots. I reheated the lentils, bacon and cabbage leftovers and put it on toast. I then added the collected greens and grated parsnip (yes fresh parsnip is quite delicious grated raw). I had some leftover whipped cream in the fridge so I added the finely grated peeled horseradish root, half a dozen pickled nasturium seeds (you can use capers instead), chopped chervil, a squeeze of lime juice and seasoned with salt. This made a wonderful peppery-cream dressing. 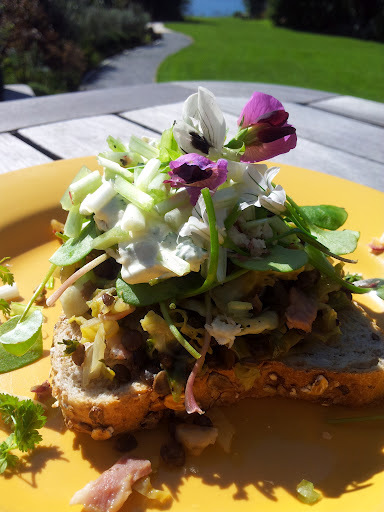 On top I added chopped previously collected and prepared wild onion, with the flowers of the wild onion, broad bean and the “purrrple” Southland salad pea. I drizzled this with some hemp oil – but a good olive oil or my favourite avocado and lime oil would be just as delicious. It looked and tasted a treat – fresh and nourishing. I am introducing you to my wild weed and flower salads. I love to create these to add colour, texture and a nourishing freshness to the standard lettuce salad. This may be intimidating for some of you at first. I suggest you slowly add these vitamin and mineral packed gems into your family’s diet as it takes time to introduce people to something different. I have been adding flowers and herbs into salads since the 1980’s, and have gained confidence in what looks and tastes good. I remember back then our friend Ian said, “I didn’t think I would be eating a flower arrangement for dinner!”. I think he thought I was a little loopy putting viola and borage blooms and calendula petals into a salad but now it’s common that restaurants add edible flowers and herbs. I intend over time to introduce you to many more herbs, wild plants and other edible parts of vegetables not usually used, e.g. broad bean green shoots and flowers. I hope you try the humble onion weed – leaves, bulbets and flowers. 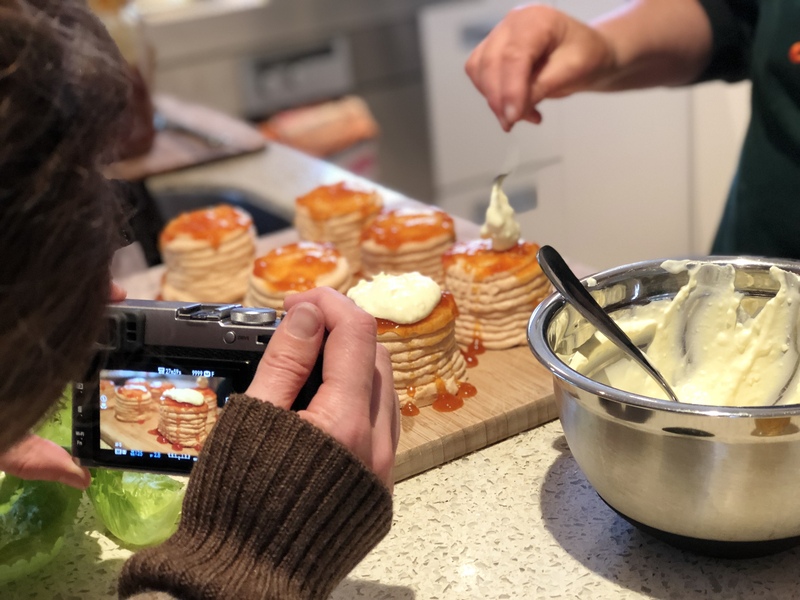 I am so pleased, Jeannie, that you are sharing your special blend of food knowledge which includes quality food from good sources, delicious flavours and beautiful presentation. I will be devouring your recipes with relish!